Essays, from Abroad, Translations and Fragments. First edition of this collection of essays by Percy Bysshe Shelley. Edited by Mrs. Shelley. 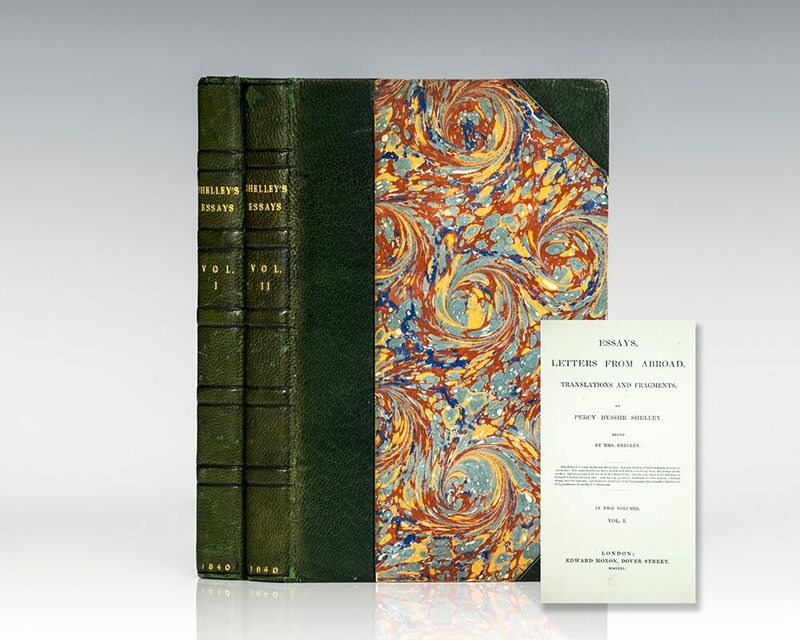 Octavo, bound in contemporary three-quarters morocco over marbled boards, gilt titles to the spine, gilt top edge, marbled endpapers. Complete with half titles. In near fine condition with light rubbing and wear. Percy Bysshe Shelley was one of the major English Romantic poets, and is regarded as among the finest lyric poets in the English language, and one of the most influential. A radical in his poetry as well as in his political and social views, Shelley did not see fame during his lifetime, but recognition for his poetry grew steadily following his death. Shelley was a key member of a close circle of visionary poets and writers that included Lord Byron, Leigh Hunt, Thomas Love Peacock, and his own second wife, Mary Shelley, the author of Frankenstein. Shelley, Percy Bysshe. Edited and with a Preface by Mary Shelley. 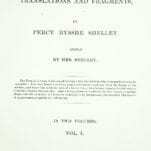 Posthumous Poems of Percy Bysshe Shelley. London: Printed for John and Henry L. Hunt, 1824. 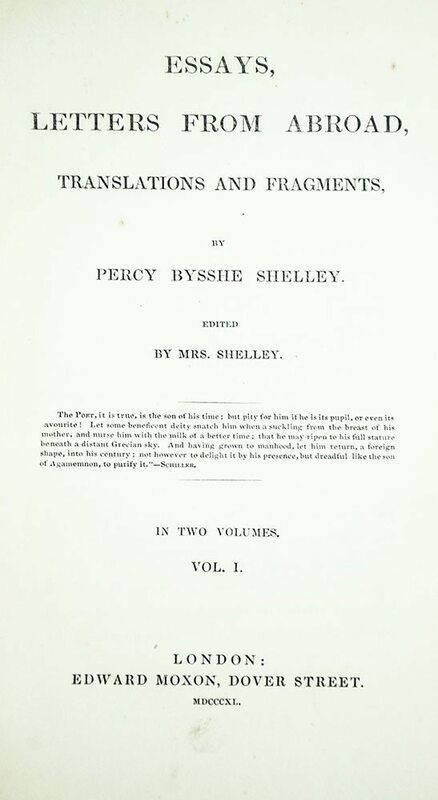 First edition, first issue of this collection edited and with a preface by Mary Shelley, containing the first publication of much of Shelley’s work. 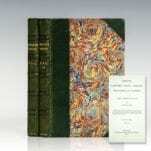 Octavo, bound in three quarters morocco over marbled boards, raised gilt bands. One of fewer than 500 copies printed and fewer than 300 actually sold before Mary Shelley reluctantly complied to Shelley’s father’s demands that she publish nothing more about his son during his own lifetime. From the library of Virginia bibliophile and historian Christopher Clark Geest with his bookplate to the pastedown. Housed in a custom half morocco box. Rare and desirable. Boston: Houghton Mifflin Company, 1940. First edition, first printing with the date on the title page of the author’s first novel and masterpiece. Octavo, original cloth. Fine in a near fine dust jacket that shows only light wear. 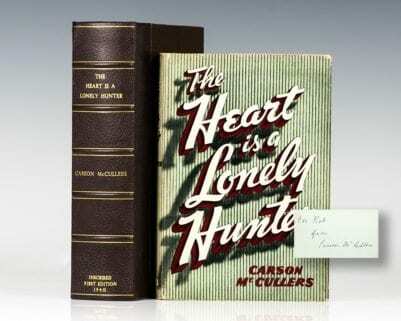 Inscribed by Carson McCullers on the front free endpaper. Housed in a custom half morocco clamshell box. A very sharp example, uncommon signed and inscribed.